High on the bluffs of the northeast we find a transition to hardwood forests overlooking lowland riparian areas of the Mississippi River drainage. More northern birds such as Ruffed Grouse are found here as well as some southerly species like Kentucky Warbler that follow the streams north. Recent research has shown this area to be critical habitat for breeding Cerulean Warblers. Although wetlands may be found in any area of the state, the most noteworthy are to the north. Much of that landscape was leveled and scoured by the most recent glacier resulting in many natural prairie potholes. Over the years most of these were drained for farming but there has been an effort to restore many of them. Breeding birds found in these areas include rails, Black Tern, and Yellow-headed Blackbird. The generally wide floodplain of the western border ends abruptly at the sandy Loess Hills. The area is dotted with old oxbows which attract waterfowl and herons. In the far southwest the rolling hills are home to breeding southern species such as Chuck-wills-widow and Summer Tanager. Each fall the Hitchcock Hawkwatch provides extraordinary numbers of migrating raptors, including large numbers of Swainson's Hawks, and is the only location in the state to regularly record a migrating Ferruginous Hawk. Before settlers turned the soil for farming, most of the state was covered with tallgrass prairie. Much of the prairie has been lost but remnants of remaining grasslands are important for many species such as Grasshopper and Henslow's Sparrow, Sedge Wren, Dickcissel, and Bobolink. At the edges of woods and row crops, especially in the southern half of the state where tillable acres do not run to the edge of the road, one finds tangles of vegetation such as this. These thickets provide good cover for species such as Bell's Vireo, Yellow-breasted Chat, Blue Grosbeak, and assorted other skulkers. Patches of woodlands remain in scattered areas and always serve as magnets for migrating passerines. Much of the southern third of the state consists of rolling hills and oak-hickory timber where we may find forest-related birds such as Pileated Woodpecker and Broad-winged and Red-Shouldered Hawks nesting. Looking at the relief map above you can see that much of the state is crossed by numerous rivers and streams. These riparian areas, when they have not been cleared for row crops, often have abundant bird life including many of our breeding species. Look for Yellow Warblers and American Redstarts; Warbling Vireos and Yellow-billed Cuckoos. 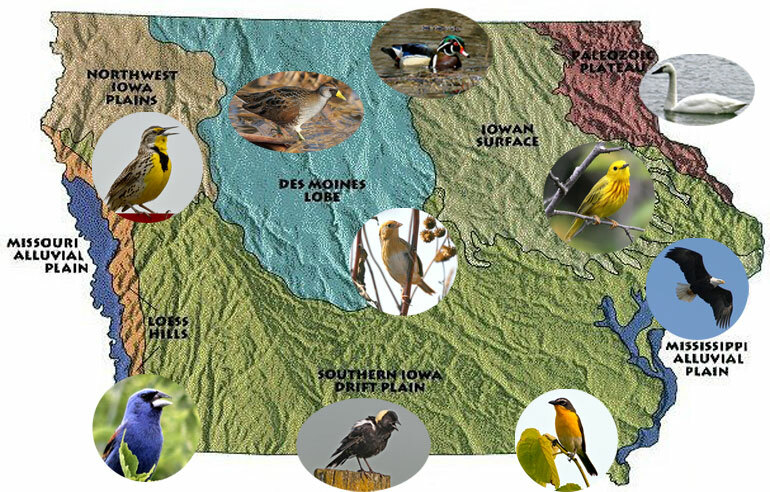 Iowa has only few large natural lakes but the creation of large reservoirs along the Des Moines, Iowa, and Chariton rivers has significantly changed some of the bird life to be found here. Large congregations of waterfowl, waders, gulls, and shorebirds are often seen here during migration. Fall is a favorite time to bird the reservoirs when you never know if a rare gull or jaeger may appear. The lowlands of the Mississippi River, with the many backwaters and bayous, are somewhat reminiscent of southern swamps. Yellow Warblers and American Redstarts are ubiquitous and this is the best area to find Prothonotary Warbler. Isolated islands in the river are home to breeding colonies of cormorants, gulls, and waders. Eurasian Tree Sparrow has expanded north from St. Louis and is now regualrly seen in Southeast Iowa. Henslow's Sparrow has some specific habitat requirements and although threatened may be found in a number of Iowa grasslands. Taken for granted by most Iowa birders, the Dickcissel is often a targeted grassland species for out-of-state visitors. Smith's Longspur is sometimes found in good numbers during migration.